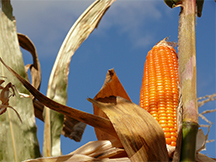 Plant & Crop Science Blog: Natural gene selection can produce orange corn rich in provitamin A for Africa, U.S. Professor of agronomy Torbert Rocheford and collaborators at Cornell University and Michigan State University found gene variations that can be selected to change nutritionally poor white corn into biofortified orange corn with high levels of provitamin A carotenoids - substances that the human body can convert into vitamin A. Vitamin A plays key roles in eye health and the immune system, as well as in the synthesis of certain hormones. Their research - with support from the National Science Foundation, HarvestPlus and the International Maize and Wheat Improvement Center, also known as CIMMYT - has yielded varieties of orange corn with markedly higher amounts of provitamin A carotenoids. But further efforts to produce even higher levels will be necessary to offset degradation of nutrients after harvest and reduce the amount of corn African consumers would need to eat to attain enough provitamin A, Rocheford said.